When unions and employers negotiate a contract, the strategy revolves around power — and perception of power. Both sides are making the calculation: How much can we demand? And what are we prepared to do if we don't get it? That's why the Supreme Court's recent Janus v. AFSCME decision — which said requiring government employees to pay "fair-share fees" to a union that represents them is a violation of free speech — raises questions about how it will affect employers' approach to contract negotiations: Will companies be emboldened? What leverage will unions have? How has Janus impacted unions so far? In preparation for the ruling, unions cut their budgets and asked members to sign cards pledging their commitment. Political observers have wondered how the ruling would affect donations by labor groups to Democratic candidates, but one telling change in campaign strategy: Unions are backing a Republican candidate, U.S. Rep. Brian Fitzpatrick, who spoke out against the Janus decision in one Philly-area congressional race. How have antiunion groups taken advantage of Janus? 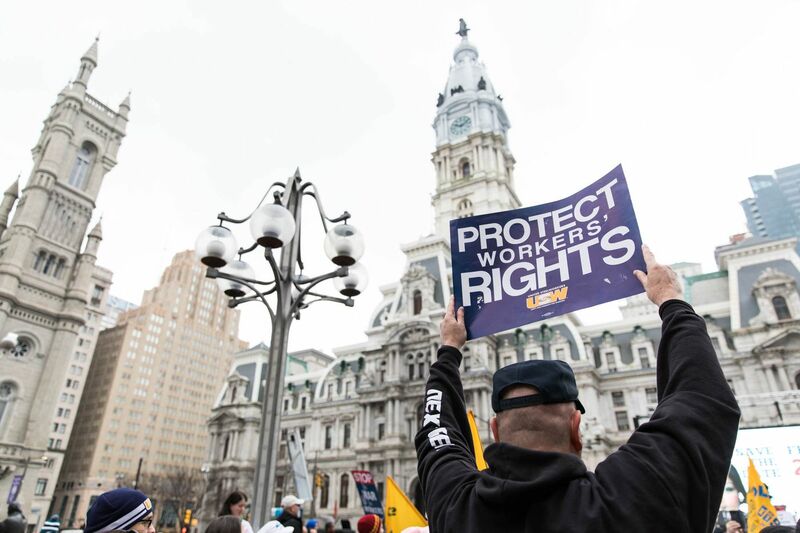 Since the ruling, these groups, including one focused on Pennsylvania, have launched campaigns encouraging public-sector workers to stop paying fair-share fees. And there are more lawsuits: Teachers and other public-sector workers, often backed by the National Right to Work Foundation, the same anti-union group that coordinated and financed the Janus case, have sued their unions to get back fees — and even dues — they say they were illegally forced to pay to unions. It's not yet clear how successful these efforts will be. This is all to say that it's too soon to tell whether the Janus doomsday that some predicted (and some hoped for) will actually come to pass. What will this mean for contract negotiations? If, because of Janus, unions have — or are perceived to have — less money in the bank, less support from politicians, or a lack of engaged membership, "they may have less power at the table in terms of their ability to put pressure on the employer," said employer-side lawyer Shannon Farmer of Ballard Spahr. That means unions could be less likely to strike or have a politician on their side. The result: It might embolden an employer not to agree to a customary union demand such as a union security clause. This could be the case in both the public and private sectors, even though the Janus ruling concerned only public-sector workers, because some unions represent both public and private workers. And it's worth noting that Janus is just the latest in a series of attacks on the labor movement — so Farmer's point could apply to more than just the aftereffects of Janus. It's important for unions to convey to their employers that their membership is involved, said lawyer Jim Runckel, who represents such unions as 32BJ SEIU and DC 33. It's why they must include members in the bargaining process (and, Runckel added, unions do that much more now than they did 10 years ago) and get them involved in such actions as rallies and pickets. Think of the tense negotiation between the Community College of Philadelphia and its staff union, which hosted a rally outside the college on Monday, the first day of the fall term, to protest working without a contract for two years. And the workers at Chestnut Hill Hospital, who are negotiating their first contract with new owners Tower Health, held a rally outside the hospital last week to bring attention to what they called the hospital network's unfair proposals. Unions should also find allies in politicians and other community members to show power, labor experts have said: Mayor Kenney, for example, was a vocal supporter of the airport workers at the center of the city's biggest successful union drive in recent memory. And after labor recently showed up to fight for immigrant rights, there might be more examples of unions aligning themselves with issues outside their usual focus — creating a bigger support network for their own cause.